Atopy is the equivalent to human "hay fever," with dogs reacting to the same things that their owners do. Flea bite hypersensitivity is the most common dog allergy, with as many as 40% of the dog population affected. 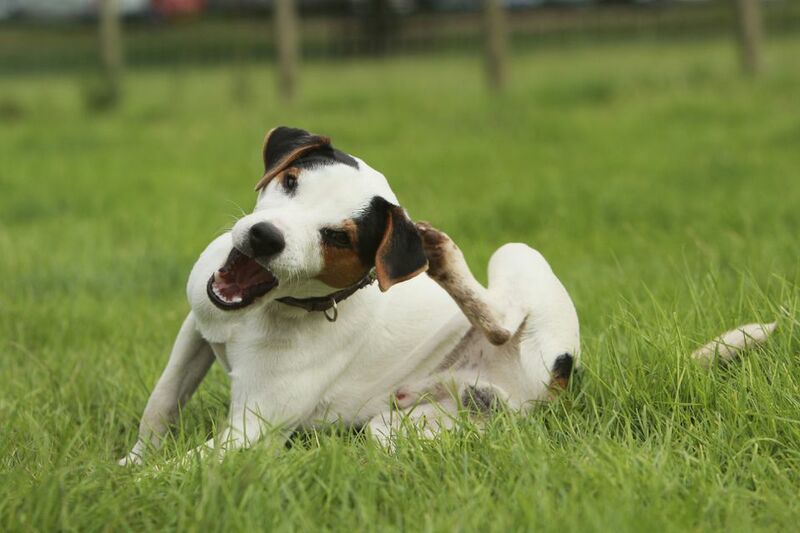 Up to half of all flea-allergic dogs also suffer from atopy. About ten to fifteen percent of the dog population is allergic to something they breathe from the environment, making inhalant allergy, or atopy, the second most common allergy in dogs. Pollen, mold, fungi, and even the house dust mite make people cough, wheeze, and have difficulty breathing, but atopic dogs more typically suffer itchiness on the front half of their body. They chew, bite, lick and rub their face, chest, armpit area, and feet. The webbing between the dog's toes can absorb allergens and make the whole body itch. Atopic dogs also commonly suffer from chronic ear infections. They can lose fur from the excessive scratching. Other kinds of dog allergies, like contact allergy or food allergy, can prompt itchy skin all year long. But atopy, like flea allergy, can be seasonal. Atopy can develop in any dog but does have a genetic component. Breeds most commonly affected include the small terriers, especially the West Highland White Terrier, as well as Boxers, Dalmatians, Golden Retrievers, English and Irish Setters, Lhasa Apsos, Miniature Schnauzers, and Shar-Pei. Most signs first develop when the dog is between one to three years old. To get rid of the allergen, it is first important to know what's causing the problem, which can be hard to determine. Although blood tests are available, they aren't always considered reliable. Instead, intradermal skin testing helps diagnose atopy. Suspect allergens are injected into the shaved skin of the sedated dog. In five to 15 minutes, positive reactions become swollen, red, and elevated, while negative reactions fade away. Dogs may react to single or multiple allergens, but even for those who know their dog reacts to house dust, it's nearly impossible to eliminate exposure because the puppy's fur is a magnet that attracts and captures environmental allergens. Totally eliminating exposure to environmental allergens is impossible with dogs that are typically indoor/outdoor pets. After all, an owner can't vacuum the yard or filter the air. But reducing indoor exposure can be helpful, and cleanliness is key. Reservoirs that attract and capture allergenic substances should be reduced or eliminated. Trade rough surfaces like carpeting and upholstery for linoleum or wooden floors and smooth fabrics that are easier to keep clean. Water filters on a vacuum help scrub particles from the air. Avoid sweeping, which tends to float allergens rather than capture them. High-Efficiency Particulate Air (HEPA) filter systems can be helpful, too. Other treatments may help relieve your dog's symptoms, even if eliminating exposure is impossible. Veterinary prescribed antihistamines relieve the symptoms in some dogs, and cortisone-containing drugs can help reduce itching. Some dogs benefit from dietary supplements of the essential fatty acids that help promote healthy skin and fur. The proper combination of these compounds appears to reduce the inflammatory skin response that results from atopy. Omega 3 fatty acids are very important to skin health and also have anti-itching properties. Because they're derived from fish oil, pets often relish them like a treat. These supplements can be bought at health food stores, pet supply stores, or a veterinarian's office. The herb calendula, (Calendula officinalis) also known as the marigold flower, is very soothing to irritated skin. Calendula tincture can be found at health food stores. Add 10-to-15 drops of the calendula tincture to four ounces of water; put in a spray bottle, and spritz the itchy areas as often as needed to relieve the discomfort. Regular rinsing reduces a pet's exposure and their scratching. Bathe puppies two or three times a week with plain water. A colloidal (oatmeal) shampoo like Aveeno will naturally soothe itchy skin. Between baths, rinse the pup's feet after its been out in the grass to reduce paw pad exposure. Hyposensitization, or immunotherapy, may also help certain dogs. The treatment is a gradual process in which the dog's resistance to allergens is enhanced by exposing him gradually to increasing amounts of the substances. After skin tests determine the culprits, the dog is vaccinated with minute amounts of the allergens in the hopes that resistance to them will build and reduce the dog's sensitivity and resulting symptoms. Because improvement from immunotherapy is slow, injections are usually continued for at least a year. Maintenance injections may be required for life. Allergies cannot be cured, and avoiding the allergy source is the only way to control the symptoms. To complicate matters, multiple allergies make identification of the culprit(s) nearly impossible. Only a veterinarian can properly diagnose allergies in a pet. Dogs are often sensitive to more than one thing, and allergies tend to be cumulative. For instance, if a dog is allergic to both fleas and to pollen, they individually may not cause problems, but the combination of the two pushes over its allergy threshold so that itchiness develops. Every allergic dog has an individual "itch" threshold, which is the amount of allergen necessary to provoke signs of disease. This is actually good news. Although eliminating all allergens may be impossible, simply reducing the amount of exposure may substantially relieve a dog's symptoms. In other words, getting rid of the fleas may help a dog be able to handle exposure to house dust without scratching.